Front row (left to right): 1. Tom Alford, 2. Richard Snodgrass, 3. Doug Kahn, 4. Greg Pierce, 5. Brian McFann. Second row: 1. Bill Judd (drums), 2. Mike Breshears (drums), 3. Matt Finders, 4. Tom Compton, 5. Steve Jens, 6. Kurt Sandholtz (piano). Third row: 1. Michael C. Ward, 2. Brian Martin, 3. Jim Becker, 4. Mike Moran, 5. Loren Fong, 6. Carl Holladay. Not in the picture: 1. Mike Estes (trumpet), 2. Mark Clarin (guitar). Credits: From the collection of Brian Martin. 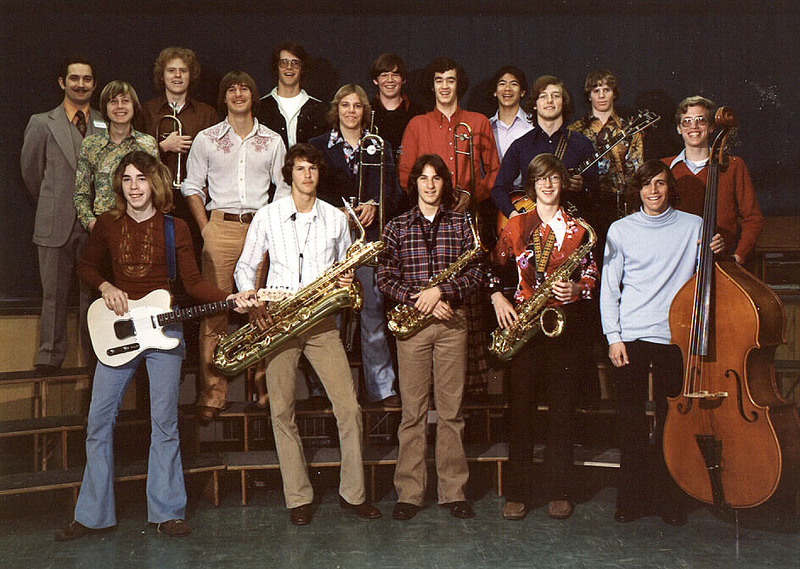 The kids in the picture are members of the high school graduation classes of 1976, 1977, 1978, and 1979. To find other pictures of these classes in the archive, see Livermore class pictures listed by year of high school graduation. And if you have any pictures from this era that you would like to share, please submit them to the Archive.